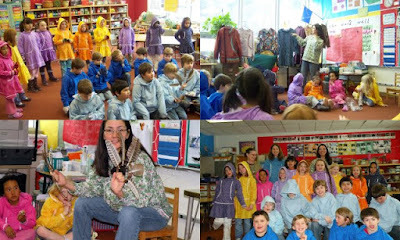 After a hyper intensive period of sewing kuspuks with a classroom of children, the class was visited by Mary Nelson, a Y'upik Eskimo native who brought her own kuspuk collection to share and display,and taught us all a Y'upik dance and song. Like Theresa John, who came and shared Making Kuspuks with us last year, Mary also has rich roots in native traditions, culture and lore. With slightly different customs and kuspuk styling, both she and Theresa John's Y'upik kuspuks had both similarities and differences. Mary taught us that in the modernized version, women are now wearing the male version of kuspuk...without the skirt ruffle and more like a pullover jacket. Some had zippers, some double pockets and one ...the first one in the line-up...had the most intricate quilted braid done in a tiny miniature form. Having done Seminole patchworking in the past, I know the intricacies involved in the detail but to see it in such a tiny form was amazing. The native sewer who had created Mary's kuspuks sews, with 6 sewing machines and 1 serger, and mass produces them for sale. While the 2nd graders loved seeing the new kuspuks and loved Mary Nelson and her stories and her beautiful Y'upik drum and fans, they loved their own chance to participate even more. While one student drummed and two others used the dance fans, all learned a new dance and chant. And wearing their own brightly colored kuspuks, (that we had helped them to make) it was such fun to join in and learn the dance, as well. These photos showcase what will be a Friday Kuspuk Day....where innovative teacher and my sister-in-law, Paula Savikko, gives her students the opportunity to learn to sew...by hand and with a machine...and to help make their own kuspuks. The class will have a chance to showcase their kuspuks (and hopefully their song and danc) before an assembly and/or in the hallways of Gastineau Elementary School...here in Douglas, Alaska. Combining the love of learning new skills, of sharing, and of teaching...this kuspuk project, like the one in 2008, reminds me of the rich cultures of native peoples.....nd the joy of being able to participate in them. As I end my final week of this month in Alaska, and my second chance to work with this project, I am exhausted by the process of combining the care taking of my parents in their island home, with my own interests and heart felt need to volunteer and share with others, and filled with gratitude that in that sharing, each and every time, I learn the depths of my own ability to create new energies, new abilities, and a strengthened endurance to continue on. Just as the fans and the drums of the Y'upik and the Tlingit peoples have inspired me with their magic rhythm,so too is there a rhythm to my own dance in this lifetime. 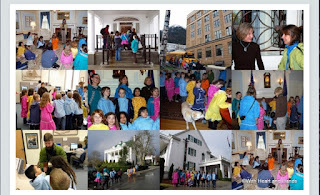 I look ahead and to my journey home to Salem, Oregon and see it all...all the magic, the power, the hard and challenging experiences, but I also see the joy of deep connection...to children, to sisterhood, to other cultures, to family and friends. And I am so grateful to have had so many wonderful opportunities to help me through the hardship of other challenges. The children look like a rainbow in their brightly colored kuspuks. I'm so glad that you are able to take some time to spend with the children while you are taking care of your parents. What an incredible journey this has been for you, each step. We are privileged that you have shared this experience with us, thank you! Safe travels home, I know you've been missed. You are such a blessing to so many! This is one of the coolest projects I have ever heard of. Awesome and really nice of you to participate in year after year, especially when you must be so busy taking care of your folks!